The picture this month is a photo with Chuck Bonham, the Director of the California Department of Fish and Wildlife, along with our Trout in the Classroom Chair, Rich Bollinger, and his wife, Judy Bollinger, who is Conejo Valley Fly Fishers’ TIC Chair. Chuck was gracious enough to stop by the Southwest Council booth at the Fred Hall Show so that we could thank him for all the DFW is doing to help with the Southwest Council’s Trout in the Classroom Program, and especially Jennifer O’Brien and Julia Swanson, who have just been wonderful in smoothing out our operations. Currently, we have Trout in the Classroom programs in close to 200 classrooms with over 200 teachers participating. Mr. Bonham was very appreciative of all the volunteer hours donated by our members. Without volunteers, we accomplish nothing. I want to thank all the volunteers who helped us out at the Fred Hall Show. This is a tough one as it spans 5 days and involves over 125 volunteer hours. We had tiers there every day helping kids of all ages tying Wooly Buggers, and folks passing out brochures for all of our member clubs. This show is a great opportunity to bring new members to the sport. It was a shame that there were no vendors there other than Guy Jeans and the Kern River Fly Shop there. We had a number of people who wanted to buy fly fishing gear that Guy didn’t have on hand because he couldn’t bring his entire shop down from Kernville. How many of those people will now shop online instead of buying from a local fly shop? Guy understands this and is there every year so that they’ll follow up with him. Next on the calendar is the clinic being put on by Southwest Casting Chair Eric Callow and friends “So You Want to Be a Casting Instructor” at Long Beach Casting Club on April 14, 2018. We’ll see if the instructors are talented enough to help me along the process. Congratulations to Dennis Panish of San Diego for becoming the newest Certified Casting Instructor in the Southwest Council! Dennis would like to thank John Adametz, Joe Libeu and John Vander Hoof for all their help along the way. Great job by all! The SWC Quarterly meetings are held on the third Saturday of January, April, July and October – so, if you’re paying attention to the calendar, our next one will be April 21, 2018 at Marie Callendar’s in Northridge, located at 19310 Business Center Drive. Everyone is invited to attend and offer suggestions, or to just see what happens. Hope to see you there. 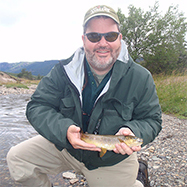 The three pillars of Fly Fishers International are Education, Conservation and Community. A great example of community occurred at the recent FlyBuy, when one of the very talented fly tyers, Cheryl Moore, gave one of our members a dozen flies for an upcoming Golden Dorado trip in Bolivia, but would not accept any money in return. Having known Cheryl for a few years, I’m not surprised. Because the recipient was so pleased by this spirit, he donated $250 to the Council in honor of Cheryl’s generosity. Thank you Cheryl for exemplifying the pillar of “Community”. It’s this spirit that I have seen for the last 13 years that I’ve been activelyparticipating in FFI! There is a new fly fishing club in the Long Beach area: Long Beach Fly Fishers. This FFI affiliate club was formed by volunteers and disabled veteran participants of the Long Beach Project Healing Waters Fly Fishing (PHWFF) program. Our weekly classes areMondaymornings at the Long Beach VA Medical Center. We’re looking forward to continuing our work with PHWFF as well as engaging with the FFI Southwest Council. We’ll see you at Club Management Day in January. be held at theApril 21stQuarterly meeting. From Bluegills to Tarpon....we want you to catch more fish and have more fun! The Fly Zone is a creative, customized, fly fishing program tailored to suit your personal needs and skill level created by Jim Solomon FFF (MCI) and Al Quattrocchi. We talked to many fly fishing guides and the most common problems they see is their clients have a hard time adapting to the various types of casts needed to be successful in their specific environments. It could be a a drag-free drift in a fast movingstream, throwing large flies under mangroves, making a soft presentation in gin clear water or quick shot to a tailing permit? Whether you are a seasoned veteran wanting to refine your distance and accuracy or a beginner / intermediate level angler looking to step up to the next level, we can evaluate your casting stroke and help you refine it. Our goal is to train and condition each angler with the casting & fishing skills necessary to succeed, wherever you fish, under all conditions. We want you to be ready for each opportunity from the minute you get off the plane to the first step onto a skiff, aflat or a bank. We want your learning curve to happen before you take that trip of a lifetime, not three days into your trip. Don’t rely on lady luck, make your next fly fishing adventure memorable by being prepared for every opportunity before you get toyour destination. Learn to fly fish with confidence, stay in the zone! Enter February 02 on your mobile calendar as the date to join us for our 9th Annual FlyBuy...the only event of its kind in the WORLD! Part garage sale, part fly fishing university (at all levels of experience), full time fun! We have something for everyone including tying classes specifically for kids!! For the price of admission, you get the chance to purchase tying material, lightly used fly fishing gear, learn from the masters of fly tying, sign up for casting lessons from the Council's finest casters and there will even be raffles and silent auctions of some great gear! And your admission includes LUNCH, cooked up by our Board Directors!! When - February 02 - 9 a.m. - 4 p.m. Casting Lessons (all levels) for $1.00/minute with 20 minute minimum. Single handed or Spey! Add distance and accuracy to your casts. Biggest Garage Sale of Fly Fishing related STUFF! Learn, observe and ask questions of SoCal's finest fly tiers!